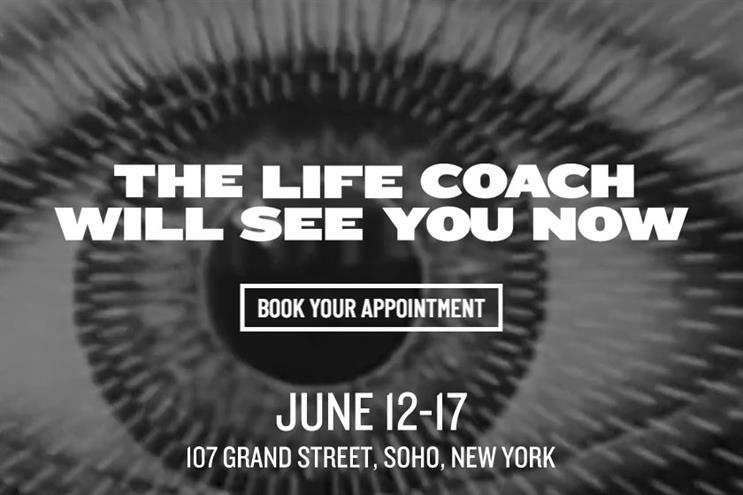 Coach, the luxury fashion brand, has created a mindfulness and self-expression multi-sensory experience in New York. "Life Coach" features four rooms where visitors must pick up a token to pass through each room. The first space is described as a "David Lynch-esque check-in", welcoming guests to the "otherworldly experience" with glitchy screens, ringing phones, red drapes and a monochromatic floor. "Logo mania" is a white subway platform where people are encouraged to draw on to "unleash their inner urban artist and create their own Life Coach story". There is also a Coney Island-inspired fairground installation filled with sherbet tones and classic carnival games. The final room is called "The dark forest" which is a path of real trees and "shadowy shapes". The experience runs this week and aims to explore "conscious consumerism". It has been created by agency The Projects, in partnership with set designer Simon Costin. The Projects founder and chief executive Jack Bedwani said: "Conscious consumerism is generally 'sold' to the public as an ideal attached to ethics and sustainability, often from a manufacturing perspective, but it's actually far bigger than that. "From our standpoint, it's about curating culture, and editing things down to what we really love as opposed to what we like or think we like."